It’s that time again …. Time for the hunk of the week! Well this week I couldn’t decide on just one. So with the advent of the summer movie blockbuster season upon us and the fact that Thor opens this weekend I decided to concentrate on …. Superheros! Specifically the few superhero movies opening this summer that I am looking forward to seeing (even if I have to go alone LOL). I will start with ….. X Men: First Class. I love the X-Men series, I loved the casting in the original three movies (how could I not it introduced the world to Hugh Jackman yumm) and I can honestly say I really like the fact that for the reboot of the series they’re not remaking the original 3, but setting it up as a prequel (whoohoo). My choice for hunk in this movie is the amazingly talented James McAvoy. I “discovered” JM in The first Chronicles of Narnia movie where he played Mr. Tumnus. Then I saw him in Penelope (what a fun movie – which I own – don’t judge) and he was cemented in my consciousness in Wanted … I need a moment. However, James also rocked it in a modern retelling of Shakespeare’s Macbeth (which also starred Richard Armitage – moment please siiiigh). He is not only cute (and Scottish) but incredibly talented. In X-Men: First Class he plays Professor X. 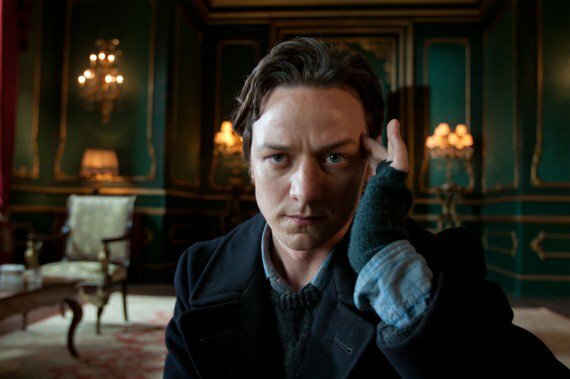 As luck would have it the old prof looks just like … well James McAvoy. So in this case, we don’t see a huge difference between actor and character. James didn’t have to work out as hard as some of the other guys on the list – but if you’ve seen him in the iconic costume – he still looks reeeeeally good in it. Next up is Green Lantern … Ryan Reynolds. Okay raise your hand if you remember a teen “soap” called Fifteen. I remember after Ryan hit it big here that I saw him on that Nikelodeon show (don’t judge LOL). I will be the first to admit I didn’t really lust after him until … his turn as the dad in the remake of the Amityville Horror – c’mon him using that axe chopping wood shirtless all sweaty and muscle rippling … yeah see what I mean? Ryan Reynolds was not only menacing in Amityville Horror, but he’s freaking funny. He does comedy with ease, he is equally lighthearted in interviews as he is on screen. I will admit I don’t know much about Green Lantern except he has a ring that gives him his power and his suit looks painted on so I am all for it :). Ryan is no stranger to movies based on comics, having appeared in Blade and Wolverine. Next is …. Chris Hemsworth. Thor!!! I will be the first to admit that I was hoping Thor would be played by Alex Skarsgard … the man is HOT and he’s Swedish. So when I heard that the Australian guy who died in the first 15 minutes of Star Trek got it I was a little (a lot) disappointed and wary. Then I saw the pictures. :0 I have to give credit where credit is due … he worked his heiny off and looks AMAZING. All I know about Thor is that he’s a God and he has a hammer. That’s it. So I’ll be going into this movie with no expectations whatsoever. My only hangup about this is the beard and hair … it’s a little distracting, no? It looks unnatural. Ah well as long as they have him shirtless I can ignore the rest. Finally … I give you Captain America, Chris Evans. I’m not a huge fan of Mr. Evans (sorry) I think it’s because he’s always sort of comic relief, so he’s hard to take seriously, but maybe CA will change all that. Like Ryan Reynolds, this is not Chris’s first superhero. He played Johnny Storm in Fantastic Four. Howerver, like the Chris above, this Chris also worked his heiny off to get into shape to play the all-American Hero. In looking for pics of Chris Evans I came across the tidbit that he was in the spoof movie Not Another Teen Movie. He’s come a looooong way :). Like Thor, I don’t know much about Captain America. I know he has a sheild. Yup that’s about it. But in looking at the trailer, I really think I am going to enjoy it. The special effects are CRAZY, have you seen the wimpy version of Chris Evans? Holy Cow! And of course there’s another small tiny reason I want to see it … Richard Armitage is in it too. (a moment please LOL). Yeah that’s right I managed to stick Richard Armitage twice in a post that has nothing to do with him LOL. So there’s my choices. Did I forget anyone, who would you add to the list? This entry was posted in Hunk of the Week, Life, Random Ramblings and tagged blogging, Chris Evans, Chris Hemsworth, Green Lantern, James McAvoy, Men, Richard Armitage, Ryan Reynolds, Thor, X Men: First Class. Bookmark the permalink. 2 Responses to It’s that time again …. oh yes he was yummy and needed more air time in the last stand. I’d love a Colossus/Kitty movie – they are a great X-Men pairing.